Hello friends and welcome to another gorgeous color story at The Play Date Cafe! May has been quite a busy month of travel for us and I am so happy to be home and settled (for the most part) for the next three months until the wee one arrives! I'm pooped! We do have the nursery we have to work on so that will be our next project as soon as we get acclimated again to being home and in our time zone! For my project I started off with a plum card base and added a panel of pink patterned paper which I further embellished with a brand new fireworks stamp from Waltzingmouse! I used watermark ink for a subtle look. 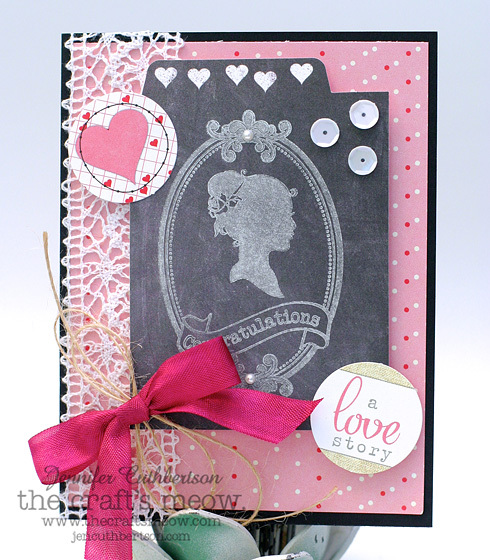 I added a journaling card, flowers, and a sheer bow to finish it up. 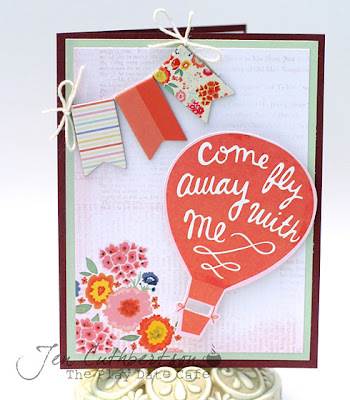 Hello friends and welcome to the new release blog hop with Waltzingmouse Stamps! If you're here from Jeanne's blog, you're in the right spot. If not, head over to the WMS blog to get started. Haven't you just loved all of the previews over the past few days? I know I sure have and can't wait to see what you all create with these wonderful new sets! For my project, I started to make a card and then decided to turn the card into a decorated treat bag. These would be great baggies for a 4th of July party or a little welcome home gift for a soldier. There is no occasion that wouldn't be great with a treat bag, lol! 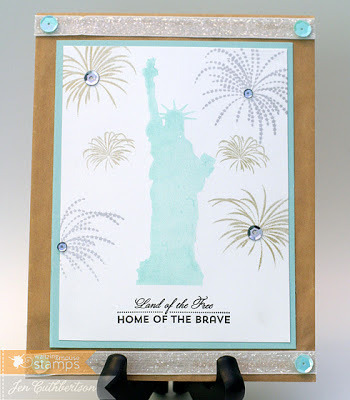 I chose the aqua to stamp lady liberty because it reminded me of her weathered copper exterior and then thought the metallic gold and silver for the fireworks would go nicely! Thanks so much for visiting today and next up is Jean! Hello friends and welcome to release day with The Craft's Meow! If you're hopping here from Jennie's blog, you're in the right spot. If not, head over to the TCM blog to get started! All of us at TCM have mixed feelings as this is Lindsay's final release with us! I've loved creating along with her and will miss her for sure but I'm also excited to see what other crafty endeavors she will be up to! For my project, I started off with some colorful papers and fun embellishments. I stamped one of the greeting images onto some patterned paper and layered it on top of another. 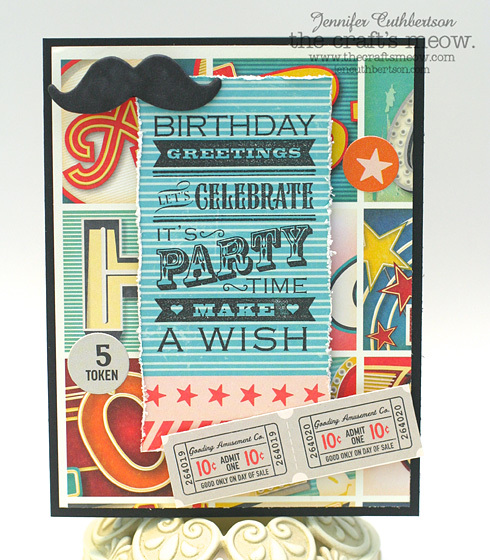 I finished the card with a chipboard mustache and some carnival tickets/stickers. Thank you so much for visiting today and off you go to Jessica's blog for more inspiration! The Craft's Meow - Day 4 Previews! Hello friends and welcome to the fourth day of previews for the May release with The Craft's Meow! Everything you've seen so far (and one new set we'll preview tomorrow) will be available for purchase tomorrow! I sure hope you've been loving what you've been seeing - I know I have! Today we're previewing "Let's Face It" by Nina B Designs! I wanted this project to be a little quirky and so I stamped the scarf image from the set and cut it out filling in only the lips. I stamped the glasses separately, cut them out and adhered them to the "face" using some foam tape. 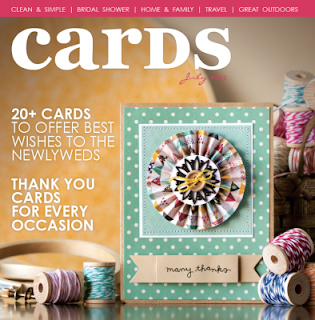 I built the card with a couple of sheets of patterned paper and a film strip frame. I finished the card with a couple of cork cameras and a sentiment/bubble from the set. Thanks so much for visiting today and I'll see you back here tomorrow for one last set preview and the big reveal of all of the sets! The Craft's Meow - Day 3 Previews! Hello friends and welcome to the third day of previews for the May release with The Craft's Meow! Five new sets will be available for purchase on the 21st! 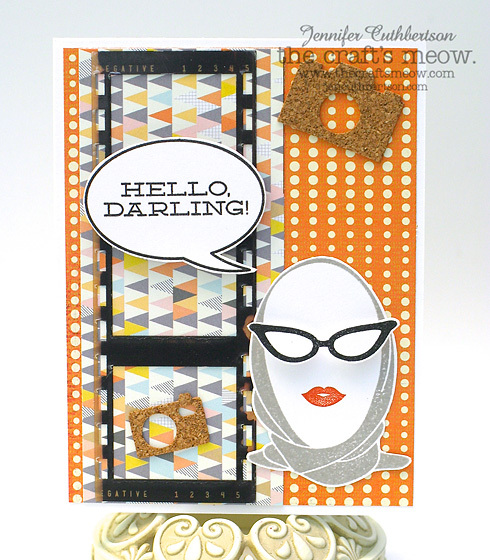 Today we're previewing "Side by Side" designed by Karen Baker! 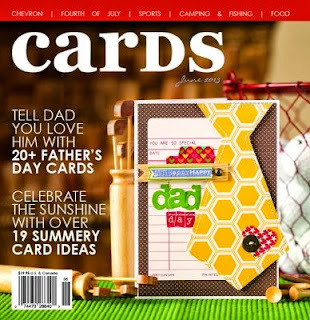 I kept this project pretty clean and simple with a bit of paper piecing starting with a white card base. 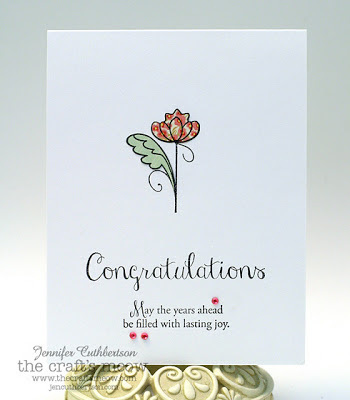 I stamped the "congratulations" and one of the other sentiments from the set on the bottom of the card and then stamped the flower in the center I stamped the flower and leaf onto patterned papers and pieced them on the card. I finished the card with some little gems. Thanks so much for visiting today and I'll see you back here tomorrow with another sneak! The Craft's Meow - Day 2 Previews! Hello friends and welcome to the second day of previews for the May release with The Craft's Meow! Today we are showcasing the second of five new sets that will be available for purchase on the 21st! 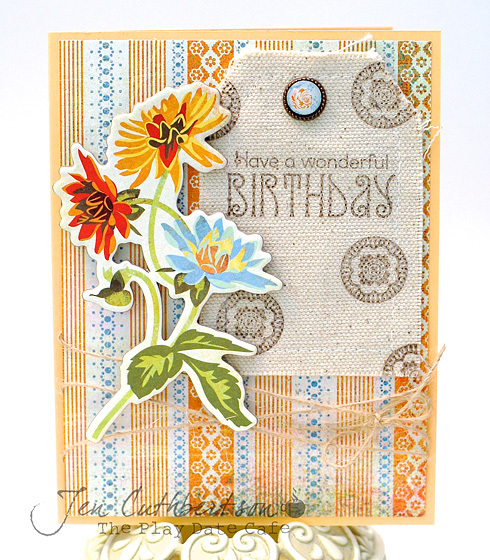 Today we're previewing "Wildflowers" by Nina B Designs! 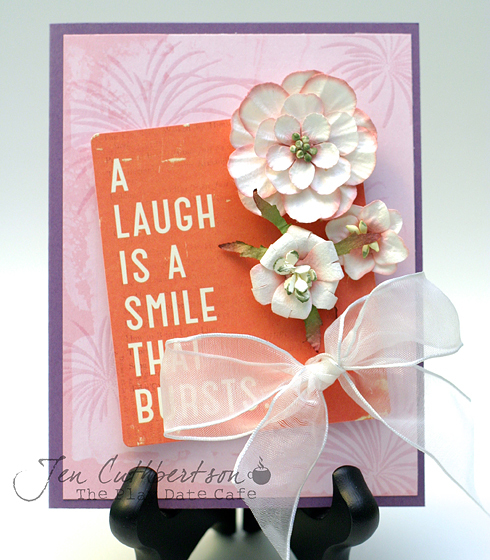 I wanted a muted color scheme for this card as I pictured it to be used for an encouragement or sympathy card. I started off with a peach background and stamped one of the sentiments from the set in the right corner I layered some crochet trim on the left side and then stamped the label with one of the flower sprays from the set using pale kraft ink. I finished the card with a pieced hummingbird and some aqua gems. Thanks so much for visiting today and I'll see you back tomorrow with another preview! The Craft's Meow - Day 1 Previews! 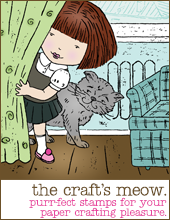 Hello friends and welcome to the first day of previews for the May release with The Craft's Meow! We'll be showcasing five new sets over the next five days that will be available for purchase on the 21st! Today we're previewing "Beautiful Hymns II" by Nina B Designs! I've been toying with my new Project Life supplies lately - just got an album and some pages so maybe I'll have a proper layout to share one of these days - and I thought the hymns would be perfect additions to my pages. We feel so blessed that our baby daughter will be joining us in September (after a long struggle and fertility issues) and so incredibly thankful that God has blessed us in this way! Thanks so much for visiting today and I'll see you back here tomorrow for another preview! Hello friends and welcome to a brand new color story reveal with The Play Date Cafe! I've scheduled several posts to go live during our trip and this time I'm actually blogging from Kauai! We just got back from a lovely day's drive to the north shore and are happily back to our hotel room listening to a Pacific storm come through. The waves are pretty loud and there is a good wind but we're enjoying the "island weather" as the hubs likes to call it. I can't believe our week is just about up - we've had an amazing time and I will share some pics as soon as we get home. For my project, I got out my Lucky Charm collection and started off with a burgundy card base covered with a panel of light jade paper. I added a panel of floral paper that has the poppy in it and finished it off with a hot air balloon die cut and some little banner chipboard stickers. Hello friends, we're still relaxing on Kauai so I hope this post finds you all well and I wish all of the mothers a very happy Mother's Day! Tonight we're planning to hit the luau so you can bet I'll be eating a lot of that kalua pork! Yummers! For this project, I used a lot of products that I recently won from Elle's Studio - three full, brand new collections! I can't believe my luck - they are all amazing! Thank you Elle's and Cards Magazine :) I started off with a patterned paper base and then stamped a chalkboard journaling card with a frame, silhouette, and sentiment stamp from The Craft's Meow, adding some white sequins for fun. I finished the card with some crochet trim, twine, and some seam binding. I just love how this came out - owuld be perfect for a wedding or bridal shower! I started off with an apricot card base and added a background of patterned paper tied with some natural twine. I stamped a birthday sentiment from Waltzingmouse Stamps onto a canvas tag and finished the card with a chipboard flower spray and a pretty brad. I just love the rustic feel of this card! Thanks so much for visiting today and remember to link up by Tuesday for a chance to win a prize from our fabulous sponsor! Please see the PDCC blog for more details! 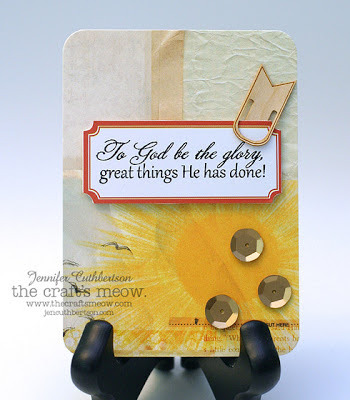 Hello friends and welcome to the monthly blog hop with The Craft's Meow! 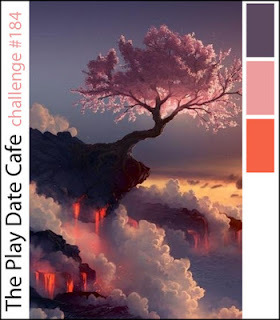 This month's theme is "flowers" and I can't wait to see all of the blooming creations the DT has come up with! If you're here from Jennie's blog, you're in the right spot. If not, head over to the TCM blog to get started! For my project, I started off with a brown treat bag, added a layer of patterned paper and stamped the bottom with a sentiment from "Inspired by Audrey." I then stamped the tulips from "Flower Garden" onto a label and then pieced the small tulips for some dimension. I finished the bag with some vintage buttons, stick pins, and some crochet trim. The bag is tied with some baker's twine. 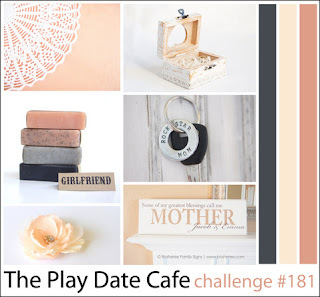 Now, what's a blog hop without a prize?? One lucky commenter will get a stamp set of their choice! Woot woot! The winner will chosen from the comments left on all of the blogs along the way and the deadline for commenting is 11:59 EST, Thursday May 9th. The winner will be announced Friday, May 10th. 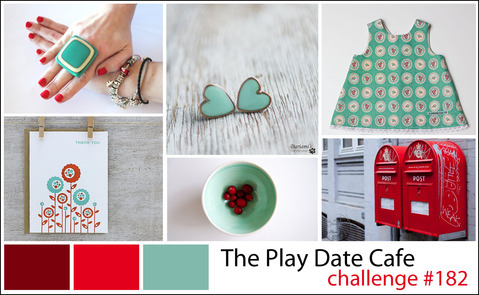 Thanks so much for visiting today and now you're off to Jessica's blog for more inspiration! Hello friends! 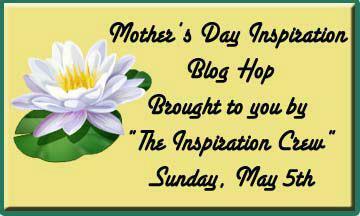 Today I'm sharing a card as part of The Inspiration Crew's Mother's Day Blog Hop! What fun! I've loved being a part of this crew for the "7 Days" projects and a big thanks to Donna for getting us all together and keeping us all inspired! I layered a thick piece of burlap ribbon over the top of a panel of cream cardstock that I stamped with one of the sentiments in the set. I then stamped the collage image onto some craft cardstock, cut it out, and distressed the edges. When I placed it on the top of the ribbon, I thought the card needed more so I picked some blush paper roses and added them to the card. Hello friends! Yes, today is the first of May (can you believe it?!) 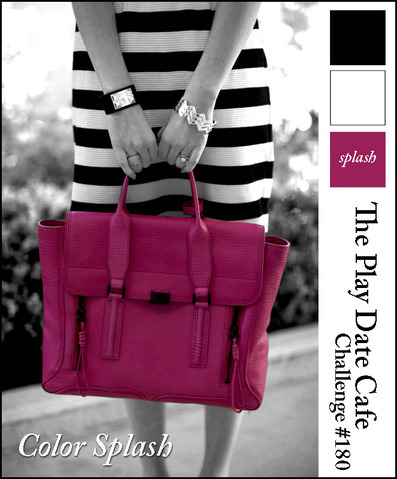 and that means a new Color Splash at The Play Date Cafe! How about a splash of magenta to get your spring/summer rolling? I think I may have gone over a splash with my card but I thought the magenta looked so nice against the black, I kept adding it! :) I started off with a couple of patterned papers and added a stamped label using stamps from Waltzingmouse. I added some lace trim and a few paper flowers and then used Stickles to give the flowers on the black paper some sparkle. Thanks so much for visiting today and I can't wait to see what you create using this splash! 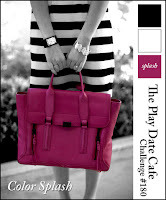 Link up by Tuesday for your chance to win an awesome prize package from our fabulous sponsor. Head over to the PDCC blog for more info!